Hard Road Tango - Joseph Leonardo: Friday, January 1, 2010 The "aime comme moi" Milonga at Berretín! The "aime comme moi" Milonga at Berretín! Let us know you're coming. Check out the facebook Event Page! 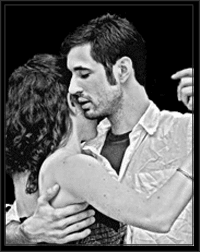 Joseph Leonardo is a talented professional Argentine Tango dancer, teacher, DJ, and event organizer from Portland OR, currently based out of Ann Arbor MI. He has taught and DJed at festivals and tango communities throughout North America.